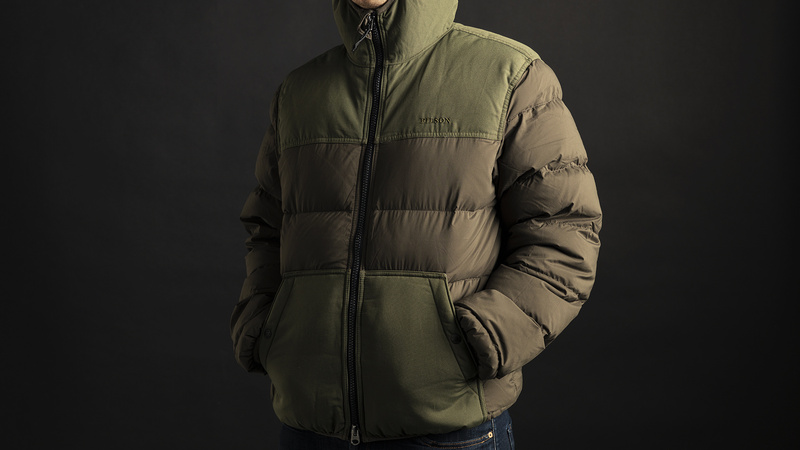 Filson Featherweight Down Jacket: What is it? A solid down jacket from a company that ought to know a thing or two about making clothes for dodgy conditions: Filson was founded in Seattle during the Alaskan gold rush of 1897, and has been outfitting people to deal with the cold and wet weather of the Pacific Northwest ever since. Over the last few seasons, Filson has turned towards a slightly more technical kind of outdoor wear, and this jacket is a prime example. Trading old-school tin cloth for an ultra-light, water-resistant nylon, this jacket is designed for throwing in your backpack on adventures in the most rugged of environments. Filson Featherweight Down Jacket: Why do I need it? A lot of outdoor gear is super functional at the expense of being super attractive, but this Filson jacket is the best of both: the relaxed all-American workwear aesthetic is maintained through water-resistant cotton shoulder and pocket padding, and the nylon build of the rest of the jacket will keep you warm and dry without weighing you down when you’re packing light. On test in West Iceland, it was plenty warm enough as our outer jacket in sub-zero conditions, and even worked well as a layer underneath an outer shell at altitude and in -16°c. As with any down jacket, you’ll need an extra shell if the rain really pours, but the water-repellent finish on this jacket deals perfectly with showers and snowfall. Our only criticism is the lack of a drawstring at the bottom of the jacket means the cold can sneak in if you don’t layer up properly in serious cold. Filson Featherweight Down Jacket: Should I buy it? It’s not often you find something that perfectly balances style and function, so if you’re looking for a solid jacket for hiking, trekking or even dog walking in cooler climes, you’ll probably want this jacket from Filson. You might look like an old-school American adventurer when you’re wearing it, but you’ll secretly be keeping your hands toasty in its moleskin-lined pockets. And for us, that kind of luxury is a big win.